I have been recycling before the concept of recycling came to the forefront. As a third generation ecologist it was ingrained into our being that we are only temporary stewards of this land and we must protect the only home we have: earth. I am therefore very puzzled when I hear people say that they don’t believe in recycling. Here are some rather interesting pieces of information for the nay sayers of recycling. I am in Florida and must admit that I have never met so many older and retired people that simply balk at the inconvenience of recycling. Our county supplies the appropriate bins and yet it is too much trouble and hassle for these people to recycle and take the bins to the front. No, most of them are not disabled, it is just pure laziness. They don’t like change and typically feel that they don’t have to change. Don’t get me wrong, there are some avid older people that recycle as well as some of the younger families that don’t participate. My own personal interest in asking if I could help a new younger family that moved into the area by getting them recycling bins ended in an argument from the husband. While he turned out to be more a of problem then just recycling, it showed me that there is still a lot of work to be done in getting the message out. The recycling process turns any portion of a product that may be useful into a new product in the effort to reduce the consumption of natural resources, the energy needed in production and the space that may be taken in landfills. Recycling just one plastic bottle will save from 100 to 1000 years as placement in a landfill but additionally saves the emissions into the environment from the production of that bottle as well as the oil that is needed to make the bottle. Each ton of plastic that is recycled is equivalent to saving the energy use of two people for an entire year, the quantity of water that is used by one person in a two month time period and around two thousand pounds of oil. 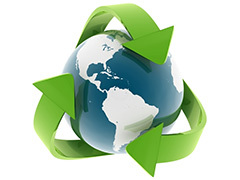 Statistics show that almost sixty percent of the trash that we throw away could actually be recycled. In a survey, nine out of ten people responded stating that they would actually increase their recycling efforts if it was made more easy. Many people were unaware that the plastic that is used to create the plastic bottles is made from the same oil that we use for gasoline. A little known fact is that it takes four thousand years to decompose in a standard landfill and yet glass has the ability for an indefinite recycle lifetime. The amount of plastic that has ended up in the ocean has actually banded together to form huge floating plastic islands. These islands are hazardous to the ocean creatures and are made of toxic chemicals that are every so-slowly breaking down into the water. Most children have had the topic of recycling, sustainable and renewable energy engrained in their educational programs. Schools, science fairs and teachers are to be given the credit for this. As far as that new neighbor with the problem? His older son kept prodding him and now they at least recycle a little bit. I think we will have to wait on the oldest generation that is stuck in their ways. Urine: A Viable Agricultural Fertilizer? How Green Are the Companies that are Touting the Title? Posted on August 30th under Global Ecology.